The framework would particularly benefit those with incomes greater than $1 million. These households will make up just 0.8 percent of Maryland’s population but would receive 109.3 percent of the tax cuts if the plan was in effect next year. This group would receive an average tax cut of $93,100 in 2018 alone, which would increase their income by an average of 4.7 percent. The reason Maryland millionaires receive over 100 percent of the cut is that the aggregate tax cut going to this group is larger than the net tax cut of $1.9 billion delivered to all Maryland taxpayers. As explained below, many taxpayers in Maryland would pay more under the plan. The middle fifth of households in Maryland, people who are literally the state’s “middle-class” would not fare as well. 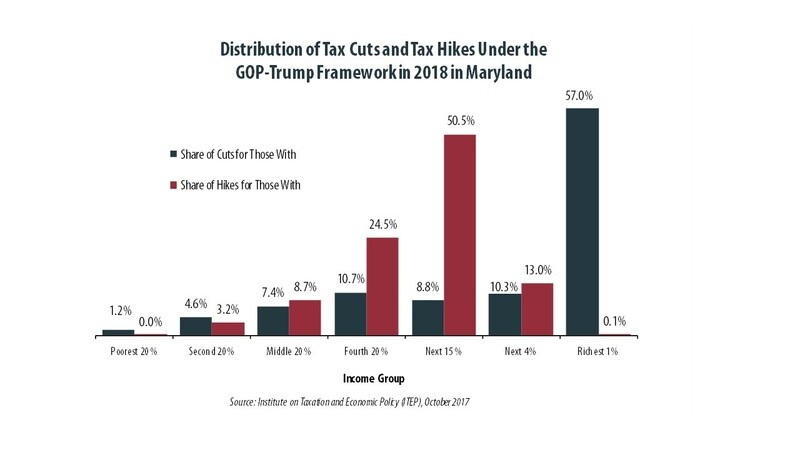 Despite being 20 percent of the population, this group would receive just 5.8 percent of the tax cuts that go to Maryland under the framework. In 2018 this group is projected to earn between $48,700 and $73,700. The framework would cut their taxes by an average of $190, which would increase their income by an average of 0.3 percent. If the framework was in effect in 2018, 30.5 percent of of Maryland households would face a tax hike. Whether a family would pay higher or lower taxes would depend on their circumstances. There are two provisions that reduce the amount of income that is subject to taxes for most families, and the framework increases one of them (the standard deduction) while repealing the other (the personal exemption). Families who itemize their deductions (rather than claming the standard deduction) may pay higher taxes beause the framework repeals most itemized deductions, including the deduction for state and local taxes. 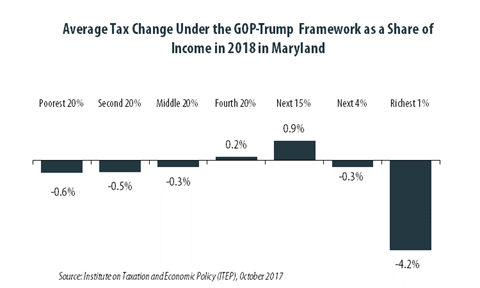 In Maryland, the average taxpayer with incomes between $73,700 and $254,900 (the fourth 20 percent and next 15 percent) would face a tax increase under the framework. 40.9 percent of taxpayers in the fourth 20 percent income group would see an average tax hike of $2,200 and 64.8 percent of taxpayers in the next 15 percent groups would face an average hike of $3,650. Additionally, the majority of taxpayers in the next 4 percent income group would pay more. In the context of the overall framework, however, its ultimate impact falls more heavily on families in the middle- and upper-middle portions of the income distribution. This is because while the taxpayers at the very top of the income distribution would initially be impacted by repeal, the tax cuts they receive in return for giving up their deduction are more than enough to offset that impact. The framework is far less generous in offering offsetting tax cuts to middle-income families. It is also important to note that the impacts of repealing the state and local tax deduction are far more sweeping than is often recognized. For the vast majority of taxpayers currently claiming itemized deductions, the loss of the ability to write-off income, sales, and property taxes means that these taxpayers will stop itemizing altogether, and will no longer receive any tax benefits associated with their charitable donations or mortgage interest payments.